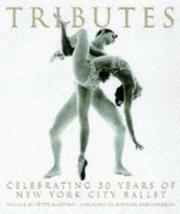 A festschrift in honor of the New York City Ballet on its 50th birthday, incorporating reminiscences and testimonial essays with photographs of George Balanchine and his dancers and reproductions of set designs, programs, and other such memorabilia. Making best use of the legion of distinguished artists and performers who have worked with the NYCB, editor Christopher Ramsey has included photography by Richard Avedon and Henri Cartier-Bresson, essays by Susan Sontag, Joan Didion, John Guare, and George Plimpton, and artwork by Marc Chagall, Isamu Noguchi, and Keith Haring. In his foreword, Baryshnikov credits NYCB co-founder Lincoln Kirstein with introducing Russian ballet to America, which Susan Sontag claims thereby made New York the undisputed capital of American dance. Informally arranged, with essays interspersed randomly among the reproductions, this looks more like a nicely bound scrapbook than the usual coffee-table volume, and the intimacy of tone which this creates should appeal to those whose interest in ballet surpasses their familiarity with it. Devotees, of course, will want the book as a matter of course.